Our purpose is to provide services that support commanders in maintaining unit financial readiness to sustain deployments and to counsel and educate Service members and their Families on financial self-sufficiency. This is accomplished through prevention education, one-on-one counseling sessions, and support services. Learning new money management skill sets or improving upon existing money management techniques will enable Service members to become financially independent, which is achieved by living within one’s means, having emergency savings set aside, setting and meeting personal financial goals, and planning for retirement through the use of the Thrift Saving Plan or other investment products. 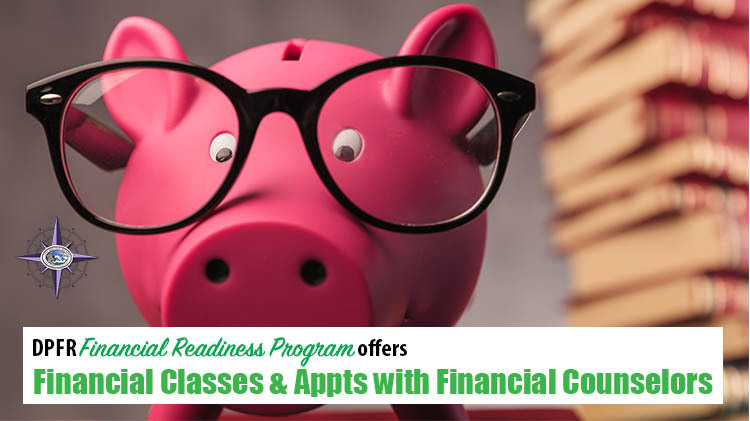 For information call 253-967-1453; to make an appointment or register for class visit jblmfrp.timetap.com. Our FRP Specialists also provide specialized classroom instruction to Service members who have been assigned to JBLM as their first duty station out of basic training or AIT. Spouses are also welcomed and encouraged to attend these classes with their Sponsor. Service members and Families anticipating PCS relocation, deployment, marriage or divorce, or who are expecting to increase their family size could benefit from the various classes offered or making an appointment with one of the Certified Financial Counselors for an individualized financial counseling session. DoD civilian employees and retirees are also welcome to use the services provided by the FRP Specialists. To find out more about our services or to make an appointment with one of the Financial Counselors, please call 253-967-1453. Military Saves Week runs the last week of February, annually. Visit militarysaves.org for additional Military Saves Week information. AER provides interest-free loans and grants during times of distress, as well as scholarships for spouses, surviving spouses and children. Contributions can be made via Personal Check, Allotment, Cash, and via Credit/Debit Card. All contributions are tax-deductible. Visit www.aerhq.org to contribute or for more information. Call 253-967-9852 for information about JBLM AER Campaign activities. For information about the JBLM Military Saves Week and AER Campaign Kick-Off, visit jblm-dpfr.eventbrite.com.